Teams are back to full strength. Both Seney and Greenway exit and both sides are skating at full strength. Badgers will get a power play as Merrimack is whistled for too many men on the ice. Merrimack called for too many men on the ice. Badgers will get their first power play three minutes into the second. First PP of the game for UW. Merrimack called for too many men for the second straight night, and UW gets its first power play of the game. Loose puck in front of the net but no one home for Wisconsin. Penalty expires and teams are back to 5-on-5. Power play comes to an end. 1-0 Merrimack, 14:30 left. Soleway, in his first game back, just rang a wrister off the post. Wisconsin's Greenway hits a pipe, and the puck comes alllll the way out to Irvine in the neutral zone. He comes in alone but is denied. Then Berry stopped a breakaway opportunity on the other end. Soleway hits the post and it turns into a Merrimack breakaway that is stuffed by Berry. 14:15 left in the second with Merrimack up 1-0. Berry makes a save on Irvine's breakaway after Soleway hit the post at the other end. 14:15 left in the second, 1-0 Merrimack. Oh, and the penalty's over. Back to five aside. Media stoppage with 14:15 left in P2. Still 1-0 Warriors. Merrimack wins a face off in the offensive zone and scores an easy goal to make it 2-0. A blocked shot by the Badgers falls right on the stick of a Merrimack player who buries it. 2-0 Warriors with 14:08 to play in the frame. 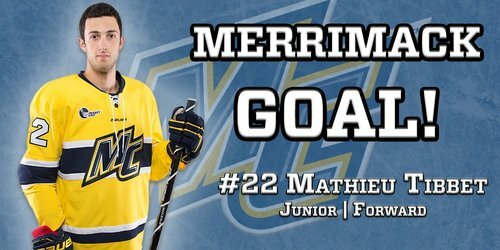 Merrimack takes a 2-0 lead with 14:08 left in the second when Tibbet scores into an open net after a blocked shot deflects right to him. It's a 2-0 lead for the visitors here early in P2. Wagner draws an interference call and the Badgers will have a man advantage for the second time tonight. Wisconsin back to the power play after a blatant cross check on Ryan Wagner. Merrimack's Kovacevic goes off for interference, and UW is on its second power play, trailing 2-0. Not a good power play thus far. Back to full strength. 10:44 left in P2, still 2-0 Merrimack. Nothing to show for the Badgers on that power play and teams are back to full strength. Halfway through the second frame. Back and forth action at the Kohl, but may be more a result of poor defense than speed/skill. Badgers have narrowed the shot gap a bit, 23-17 Warriors. Berry catches a Merrimack shot and freezes it with 7:55 to go in the period. Warriors still up 2-0. Merrimack's forecheck and neutral zone discipline are as advertised tonight. Both giving UW fits. Wisconsin will go on the kill after a hit from Ustaski. Might have been elbowing? Ustaski is guilty of elbowing and UW will head to the PK for the second time tonight. 6:37 to go. Power play coming up for the Warriors. Wisconsin's Ustaski called for elbowing with 6:37 left in the second. UW's Ustaski gets called for elbowing with 6:37 left in the second, and Merrimack goes to its second power play (0-for-1). Good shorthanded chance for Hughes, but Collin Delia denies it. Berry sticks a shot from the point. 1:08 left on Warrior PP. Wisconsin back to full strength. P2 | 4:33, still 2-0 Warriors. Penalty is over and Ustaski exits the box. Under 4:30 to play in the second. 4:10 left in the second, Merrimack leads UW 2-0.